After decades of decline and a devastating 2018 election that gutted an already decimated state party, the GOP’s more moderate wing is gearing up for a state convention this weekend that some argue is their last opportunity to avert total collapse. A battle over the state party chairmanship offers two competing visions for the future. One tightly embraces President Donald Trump, while the other focuses more on the nuts and bolts of party-building and organizing. The two approaches aren’t exactly complementary. Trump, who lost California by a stunning 30 percentage points in 2016, remains highly unpopular here: Nearly two-thirds of voters disapprove of his performance as president. As it stands, the Republican Party in the nation’s most populous state is barely breathing. The midterm election saw the landslide victory of Democratic Gov. Gavin Newsom, a revived Democratic supermajority in both legislative chambers, and the flipping of seven GOP House seats. 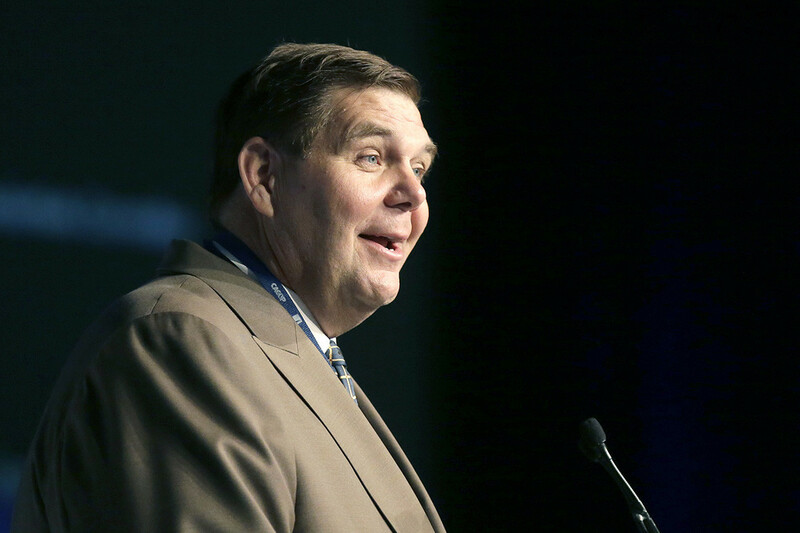 Whomever California Republicans elect to succeed Jim Brulte, the former state senator who has led the party for six years, won’t be able to reverse the party’s fortunes anytime soon. But they might be able to halt the downward spiral. For weeks, the candidates have been lobbying, mailing, phoning and campaigning up and down the state to offer their prescriptions. Jessica Patterson, the CEO of the California Trailblazers — a candidate-recruitment program blessed by House GOP Minority Leader Kevin McCarthy — has racked up the lion’s share of endorsements from state elected officials. A Latina from a Southern California working class family, Patterson says she voted for Trump. But she argues that her leadership of Trailblazers has armed her with the experience and the strategic knowledge necessary to build the party back to its former strengths in California — and to reassure key donors regarding its rebound. In her view, Republicans must “stay on message” — jobs, economy, education, pro-business policies — and concentrate on the damage she says the ruling party has done in Sacramento. But the two conservative grassroots activists who are challenging her lay the blame for the 2018 battering partially at her feet. Allen argues that neither Brulte nor Patterson have shown the robust support for Trump that he deserves — and that he contends would fire up and energize the GOP base. Allen, who staunchly backs Trump’s anti-illegal immigration rhetoric and his call for a border wall, is reprising the populist rhetoric that marked his failed GOP 2018 gubernatorial campaign — and helped him to amass an unprecedented mailing list of 25,000 activist GOP donors and supporters. The eventual nominee, the more moderate multi-millionaire businessman John Cox, admitted he didn’t vote for Trump and lost in a landslide defeat against Newsom. But Allen may end up splitting the conservative grassroots vote with another anti-establishment Republican, Stephen Frank, the publisher of the conservative newsletter California Political Review. A former party official whose roots in state GOP activism go back decades, Frank lambastes the current state party leadership, saying it “has unilaterally disarmed,’’ failed to mount candidates and voter registration campaigns, and was entirely outplayed by the Democratic Party in the 2018 election, which flipped House seats with the help of aggressive practices like ballot harvesting. Worse, he said, the state GOP lacked a cohesive message on issues like key issues like education and job opportunities — even while it ran away from President Trump. The current political demolition derby underscores divisions that have dragged at the party for years. Those divisions mirror almost precisely the battles being waged in the national Republican Party, he said, where Trump’s loyalist base defends the president’s positions and see his leadership as the key to future electoral successes even as some mainstream Republicans in elected office wince at his rhetoric and his impact on the GOP brand. Leading Republicans claim the situation will deteriorate even more if either Allen or Frank claim the chairmanship. Former Assembly Minority leader Chad Mayes took to Twitter to push back against Allen’s jabs at the GOP establishment and elected officials. He tweeted a prediction that if Allen wins the chairmanship, “more sitting legislators will leave” the California Republican Party. Brulte, the current chair, shrugs off the criticism from the grassroots candidates, saying that despite inheriting a party in disarray six years ago, he has rescued it from financial ruin and will leave the state GOP fully able to “pay all of its bills” by the time of the next chairman’s election on Sunday. “Campaigns for party office can be just as rough and tumble as a campaign for public office,’’ he said, estimating that between the three candidates for chairman, they will collectively spend over $400,0000 reaching out to the 1,383 delegates at this convention. Brulte rejects the notion that the party hasn’t supported voter registration efforts or done outreach to its own voters, calling that “factually incorrect.’’ He notes that in 2016 alone, independent groups backing GOP causes spent more than $2 million registering GOP voters in California. The next chairman will have to address those criticisms — and some more immediate matters of party operations. After years of unpaid fundraising and oversight in the job, Brulte began receiving compensation — $21,000 a month — after new party new bylaws were adopted in October of 2017. Following Sunday’s election, the party’s board will decide if the new chair will hold a paid position — and what the level of compensation will be.